Glitter has become part of our day to day activities. Kids school activity materials like glue, color pens, party occasions, make up, hair products, nail polish, bangles, wrist bands, greeting cards- everywhere we see glitter in various colors. Even our clothing is not exception. In fact, many celebrities wear glitter cloths, and shoes! We have heard the effect of microplastic in food and water. Glitter is nothing but (categorized) microplastic. It has plastic and aluminum and is harmful to health and environment. 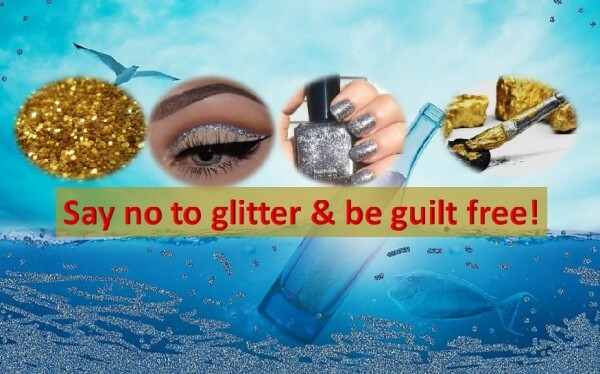 Say no to glitter and be guilt free ! Nurseries a British Child care provides declared that more than 2000 children under its care will no longer use glitter for activities. However, adults need to understand the impact of sparkles and should teach children the consequences of using glitters. Did you know people are using glitter not just for celebration? It was even used for protest. According to NY times Gay rights activists glitter-bombed conservative politicians! Glitter pollutes fresh water, ocean, and lakes! Cosmetic glitter made by binding aluminum with PET (polyethylene terephthalate). These two chemicals known to release chemicals that cause hormonal imbalance. Glitter released in waste water eventually gets into river and sea and end up in food chain and returns back to human body – this time as food! According to UN report (2017), these microplastics come back to our pate through aquatic edible animals. Around 4.8 to 12.7 million tons of plastic entering ocean every year. Many marine creatures consume microplastic for food. Some animals like Eurasian perch larvae prefer microplastic over the usual diet! These zooplankton eating plastic and consumer will end up with plastic in stomach through food chain. Microplastics also harm animals by causing blockages in the gut and causing change in their energy levels. According scientists’ dangers posed by sparkles used in cosmetics and children crafts is more than what we expect. When glitter drifts into earth, down the drain it becomes microplastic pollutant. Water filters does not always filter these particles. What actions we can take to protect our health and environment from glitter? Do not use glitter, stop using glitter in parties and festival occasions. Do not buy glitter paints and glues for children art work. If you cannot be without glitter, then use ecofriendly glitter made of biodegradable cellulose film. Ladies try using synthetic fluorphlogopite based cosmetics which is similar to mica (that is present in sand). Did you know glitter can be made from eucalyptus tree extract and aluminum? When you go for ecofriendly products, those products become mainstream and will be affordable. Make an appropriate choice for yourself and let it be healthy. When you stop using glitter you will be guilt free !.